We are now a week into the summer holidays and it seems to have disappeared in a blink. Our new flooring took four days to lay, with the help of Grandad South and there are still skirting boards to refit, so the house has been upside down with furniture and toys in the wrong place. It will be a relief when everything returns to normal. My task, whilst the floor was being laid, was to keep the children out of the way so we enjoyed trips to the libray, local park and zoo and then, with furniture not yet restored, we visited friends and a local Farm and Adventure Playground. So apart from one day which was spent catching up on washing, having been without the machine for nearly two weeks, yesterday was the first real opportunity to get stuck into the garden. Having been left to its own devices for so long, the garden is showing signs of overgrowth, so I decided to systematically work around the raised beds, harvesting anything that looked ready and pulling out weeds on the way. By the end of the day, parts of the garden were looking tidier and our kitchen table was covered with lovely fresh vegetables. I spent the evening cleaning them up and tonight we will enjoy a lovely meal entirely from homegrown vegetables, with plenty going spare. Whilst Garden Boy wanted to play Pirates, Garden Girl was a massive help in the garden yesterday. She was very eager to harvest vegetables with me and while Garden Lass sat contentedly podding broad beans (I think she would happily do this all day, she loves it so much), Garden Girl and I worked our way around the garden, enjoying the sun and a lovely chat. 'Wakey, wakey onions', she shouted, as she pulled them out of the bed. 'It's time to see the sun'; then 'These carrots are huge, Mummy. We will have to dig as far as Uncle M's world (Peru) to get these out.' She chattered excitedly about how we should cook all the lovely vegetables and what we should plant in the spaces left by the onions and shallots. Then the conversation moved to the activities we did last summer about garden bugs and Garden Girl asked if we could do more this summer, so we thought about the best creatures to pick. 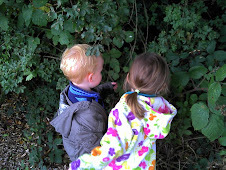 Both Garden Girl and Garden Boy wanted to look again at all the creatures we learned about last summer so we will spend a week revisiting butterflies, ants, ladybirds, worms and snails. Then with the remaining four weeks they have chosen Dragonflies, frogs, birds and spiders. Its nice to have a plan for the summer which everyone is excited about. Thanks for the inspiration to get started with planting seeds for the antipodean summer! It's wonderful to put together a whole home-grown meal. I'd be interested to know what varieties of bean and zucchini you planted? They're a lovely range of colours.